The Technical and Vocational Training Corporation (TVTC) held recently the “National Saudi Skills” event in Jeddah, where technical institutes students from all over the kingdom participated to showcase their skills and technical knowledge in several areas. Student contestants participated from all over the Kingdom. Sajjad Mohammed Al Jarrash, a Saudi Readymix sponsored student at the Saudi Petroleum Services Polytechnic, who recently completed his training and joined the Company, participated in the area of welding in the Saudi Skills Competition. The contest involved a series of project-based activities that requires hands-on skills along with focus on the fundamentals of safety while performing the tasks. The contestants were judged on comprehension, ability, accuracy and quality of the completed project. 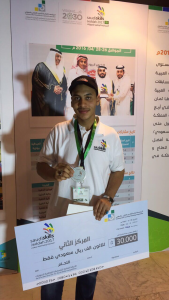 Sajjad came in second place and won a silver medal for Best Saudi Skills in Welding and received a SAR 50,000 award. In an interview with Mr Sajjad Al Jarrash, he reflects how the Government’s and Saudi Readymix’s support and recognition for his unique welding skills has empowered him, raised his confidence in his own skills, as well as motivated other students and co-workers. A: My name is Sajjad Mohammad Aljarrash, I live in Al Qatif, Eastern Province and I am 21 years old. I studied at the Saudi Petroleum Services Polytechnic and I earned a Diploma in welding skills with a grade of 4.44 out of 5. What inspired me was that this specialty is a passion and one of my hobbies. When I was admitted at SPSP, Saudi Readymix sponsored me and offered me a job as a welding technician after I graduated. I am now proudly working for Saudi Readymix. Q: Tell us more about the award you have received. A: Alhamdulillah after I was ranked second on the Kingdom in welding skills, I received an amount of money from the Technical and Vocational Training Corporation offered from HRH Prince Khaled Al-Faisal. I also received a certificate from TVTC and a silver medal from the Saudi Petroleum Services Polytechnic. Q: Your Institution has voted you in 2nd place as best welder in the Kingdom of Saudi Arabia, what do you value most about this recognition? A: I admit that the greatest value I got through this reward is honouring me with your presence, giving me confidence and encouraging me move forward. This is all because of your support, this is all what an employee needs from his staff needs his company. Q: Can you tell us more about the safety practises in the welding field ..
A: I advise anyone who works in this field to strictly abide by safety instructions and guidelines. Do not hesitate to seek your trainer or other welding professionals to ask them about any queries that you may have. Immediately ask for the help of your instructor or supervisor. Everyone should use safety personal protective equipment (PPE) for welding and keep any flammable items away from the working area. It is a very important concern to care about your own safety and the safety of those around you when you are welding. Q: Tell us about a challenge you’ve faced and how you’ve dealt with It. A: One of the major difficulties I faced was during the preparation for the competition. I was under enormous pressure and trained continuously for two months for over 18 hours a day. After the blessing of Allah, Mr. Rami Alturki offered a lot of support and gave me the required time to prepare myself for this contest. But all the time, preparation, effort and stress were forgotten the moment I was recognized and received this award. Alhamdulillah. Q: Did winning this award change your life in any way? If so, in what ways? A: Yes, it is without any doubt that everyone strives to achieve and become the best in his field. It was a great feeling to have made reached this goal and to raise the name of my Company, Saudi Readymix, in this field in the Kingdom. This award made me more confident in my skills and also on a personal level more confident socially. Saudi Readymix has continuously supported and invested in the skills and talents of its employees. In addition to its sponsorship program for vocational students, the Company runs several internal training courses and seminars for all its employees.